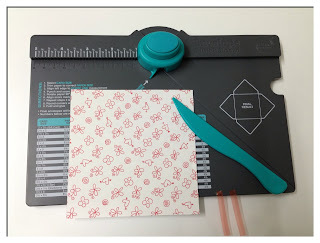 Product Review: The Envelope Maker! We R Memory Keepers tool Envelope punch board! Its the best buy that I've ever made after I purchased my big shot!! Ofcourse one can make envelopes with scoreboards as well, but this one makes life sooooo easy! Trust me! 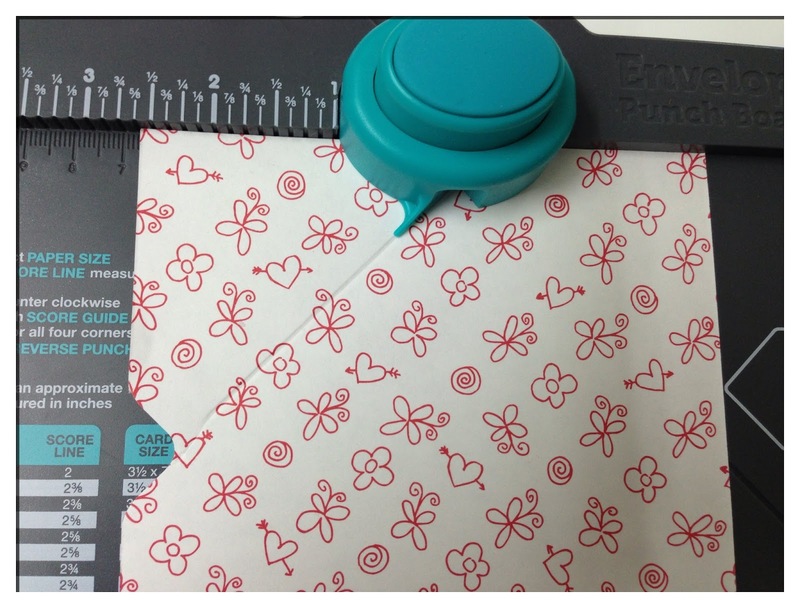 Because it also does the punching saving you time on cutting the corners! 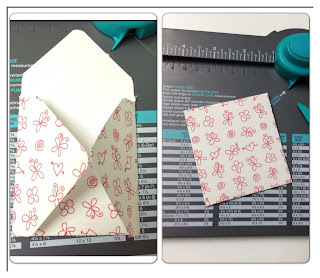 :) All you have to do is simply choose the size of the envelope you want from the sizes listed on the board itself and simply trim your paper down to the measurements mentioned. Then rotate and punch at the measurement and score and thats it! 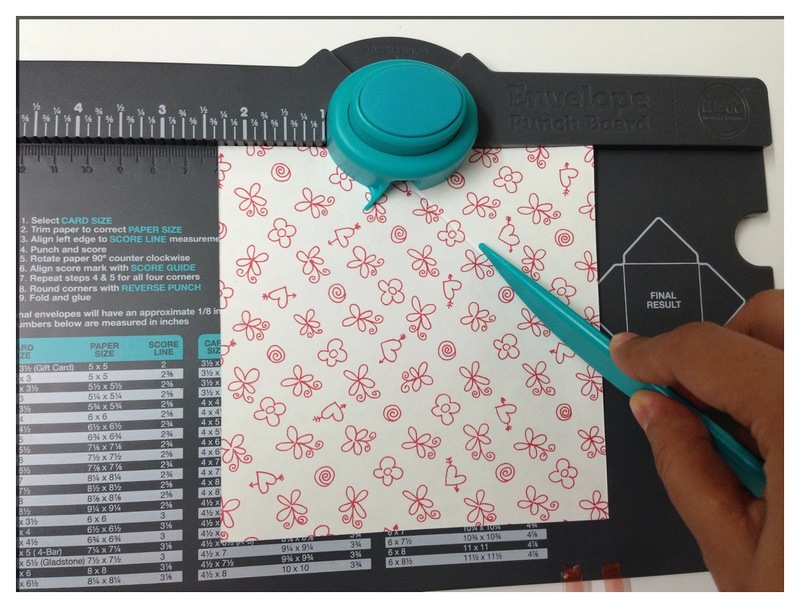 STEP 2: Using the grid mentioned, place your sheet at the specific measurement and punch, then score. STEP 3: Rotate your sheet and then align your score line with the little blue line at the centre. 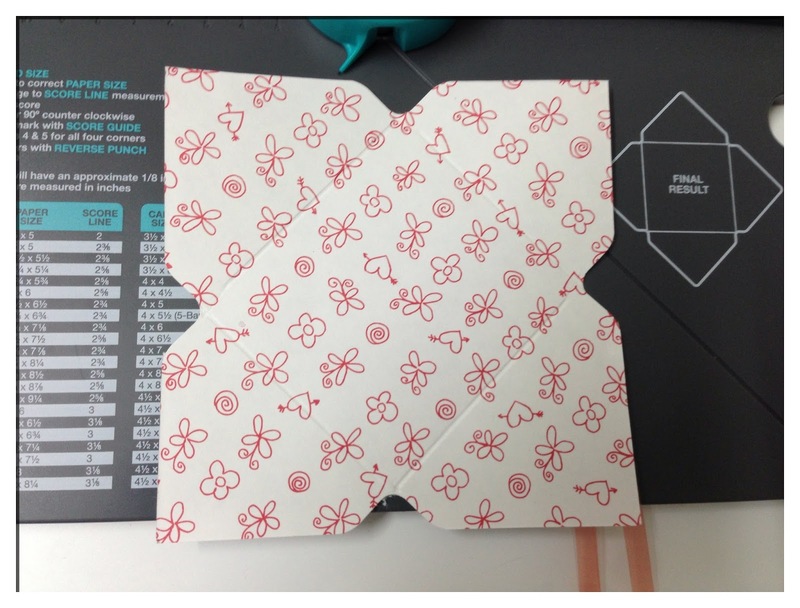 STEP 6: Fold your scored lines and glue! 1. 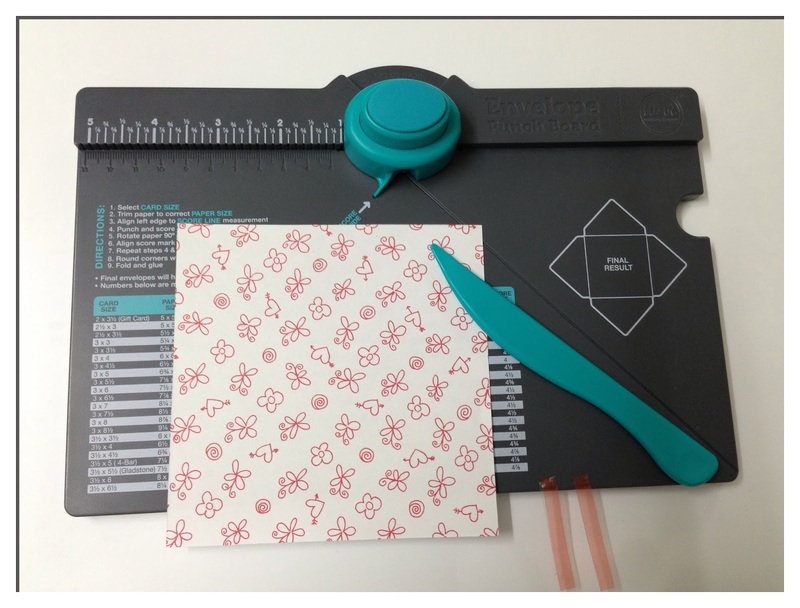 Make sure that you align your first measurement accurately or you will have a wonky envelope. 2. Same goes for aligning the score lines with the blue tip. 3. The bone folder is best used at 45' angle else it might pierce your paper. 4. Although it works with most papers, very thick papers may not punch cleanly. 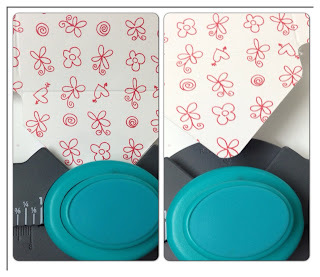 Here is how I used my envelopes. I've used memory box dies on all of them. Aren't they beautiful? Clean cut lines with beautiful shapes! Check them out at the Lulupu store here! 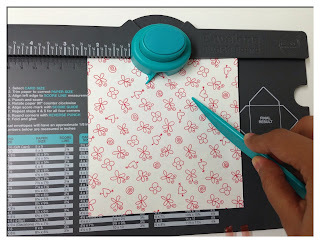 Botanical Odyssey Paper Pad 6.5"X6.5"
I'm exited about today's post!! You will be wondering why.......well, today's post is about the beautiful machine called Silhouette Cameo, and why I'm so exited? because this beauty can do pretty much everything, and I suggest that if you don't have it, do everything to own it!!! Now entering into the project that I made for your inspiration, I did a quick video tutorial to show you how to make a card with butterflies flying! Yes, you can have that effect. 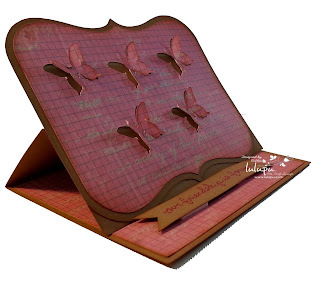 I used the a2 lori whitlock bracket easel card and the butterflies set, you can find the at the Silhouette store. Also, I used Kraft paper for the base of the card, pattern paper that I distressed at the edges with distress ink tea dye. The sentiment is from Lawn Fawn. I like the Shabby Chick look and I think that it goes perfect with butterflies!Hope you like it!!! 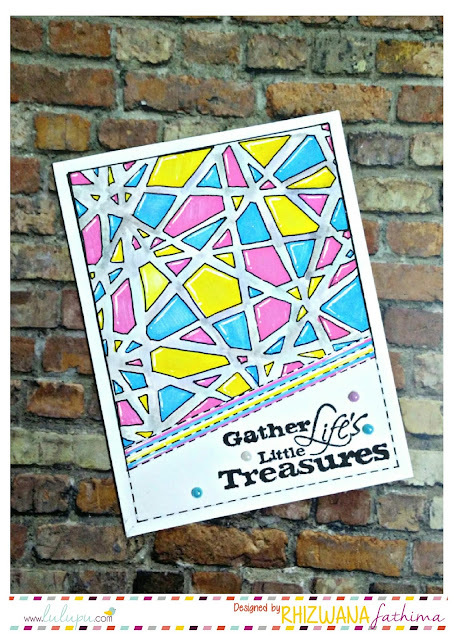 Don't forget to participate in the current Lulupu Challenge #14 Color Crush!! 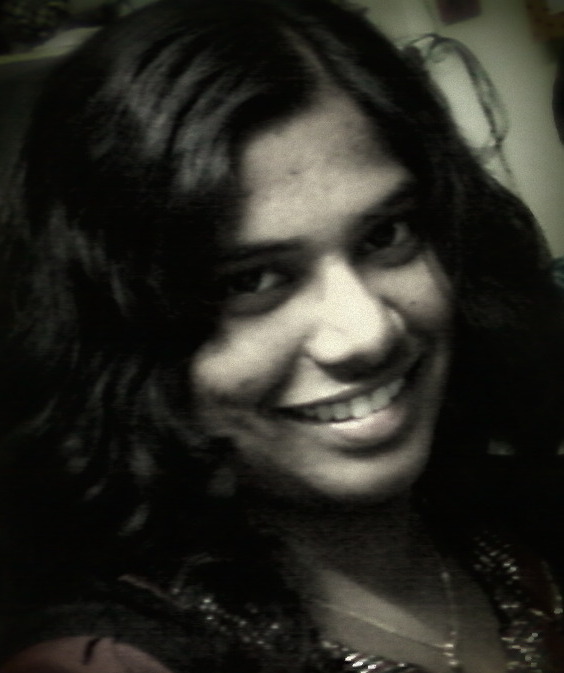 Its Varshitha here and today i will be sharing something exciting that i discovered sometime ago. Yes Its something to do with your Back Ground stamps and stencils! 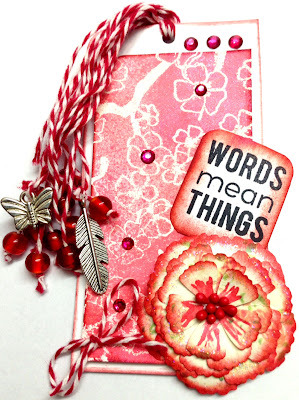 Did you know that Background(BG) stamping (like burlap, polka dots, scripts, grunge, etc) and distress inking the bold distressed shaped stencils together creates awesome BGs to your cards, LO's and tags. 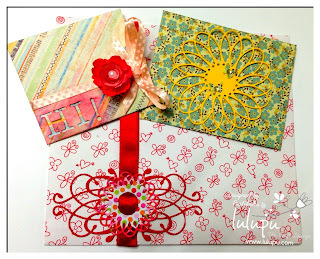 Before i forget do check out the Lulupu July Share and Win contest. Just upload any creation made with products purchased from Lulupu and get lucky! How simple! Memory Box + Bonus Inspiration!! 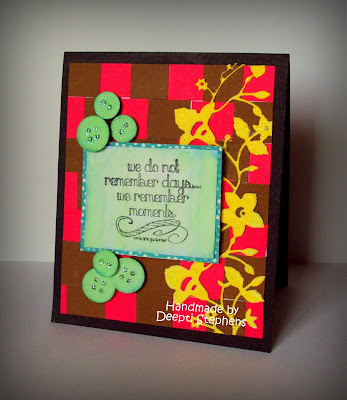 We are excited to feature another talented crafter - Deepti as a guest Designer at Lulupu. Deepti won our last challenge and stole our hearts with her winning entry! Hi everyone! Hope you are all good.. 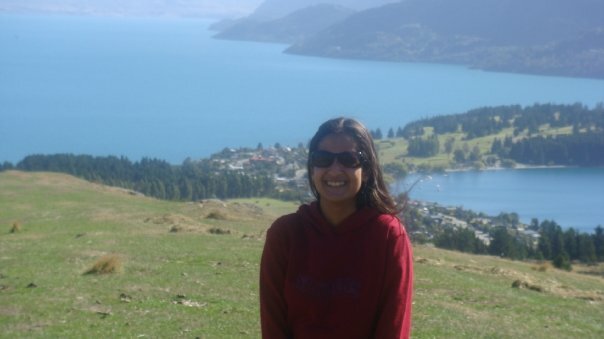 When Karuna told me about the challenge, I had many plans in my mind but none helped me.. So I went with a very simple sketch. 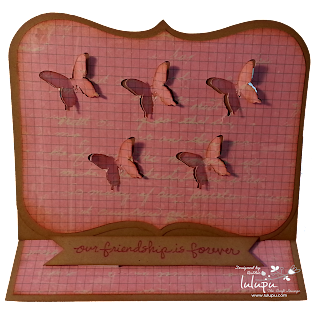 I seldom use die cuts and PPs on my projects.. That’s really challenging and I must admit I had a little confusion while making this card but I love how it turned out J…. The logo colors are really cool but trust me they are not that easy to combine.. That is a great twist too but I enjoyed it thoroughly.. That’s it guys!! 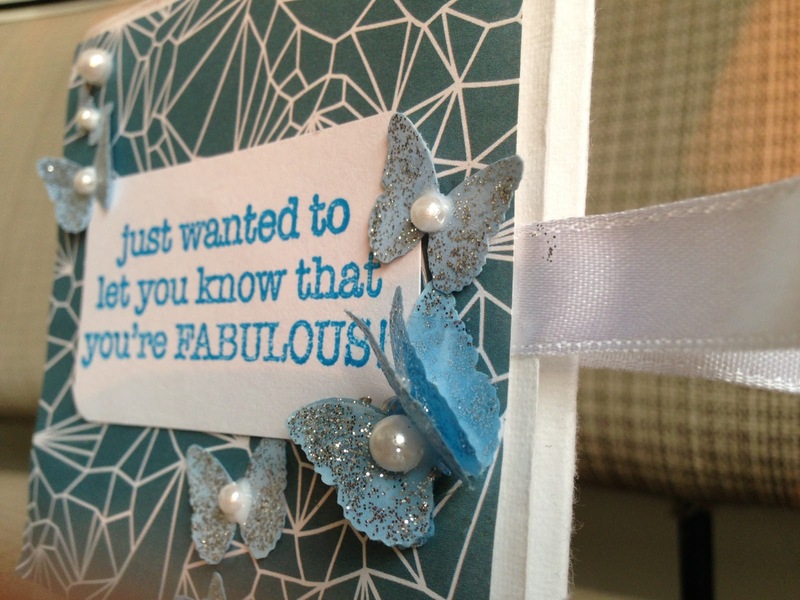 We hope you are enjoying the fabulous creations by our Design Team for our Challenge #14 - Colour Crush - use your dies. We have some very exciting news for you all! Since we have a Huge Fan base who send us their creations regularly via email or share on FB we would like to encourage you all to share your fabulous creations using your latest shopped product from www.lulupu.com and stand a chance to win some goodies from your favourite store as well! This contest will be open from 15th of every month and will run till the end of the month. This contest is specially open for Lulupu customers only. Failing to abide by below rules can result in deleting your entry without prior notice. 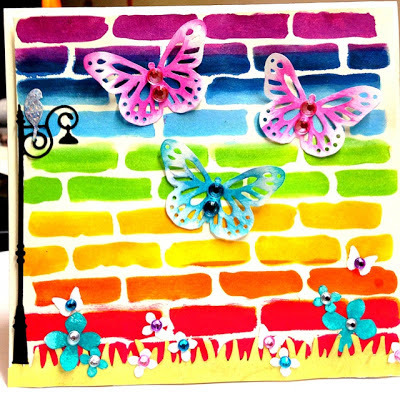 Create a project (card, scrapbook page, ATC, Tags, Bookmarks, mixed media canvas or whatever) using atleast 2 products purchased from Lulupu Store. Mention these products on your Blog Post and link them to the exact products on our website. Upload your project to your blog or to Flickr (or some other similar Web site) and figure out the exact URL of that page. Cut and paste the exact URL into the Inlinkz tool below. Please only one entry per person! You can then ask friends and family to come and vote for your project. So the earlier you create you link the longer you have to get more votes! You can share your links on FB as well. Project with maximum votes will be announced as a winner. The winner will receive Goodies from our store. 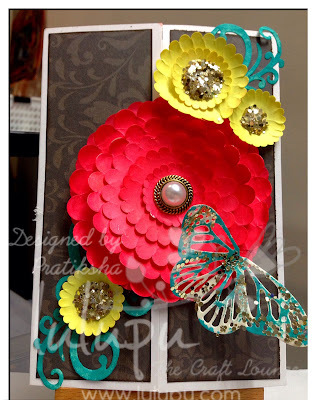 Welcoming Pratiksha and some inspiration! 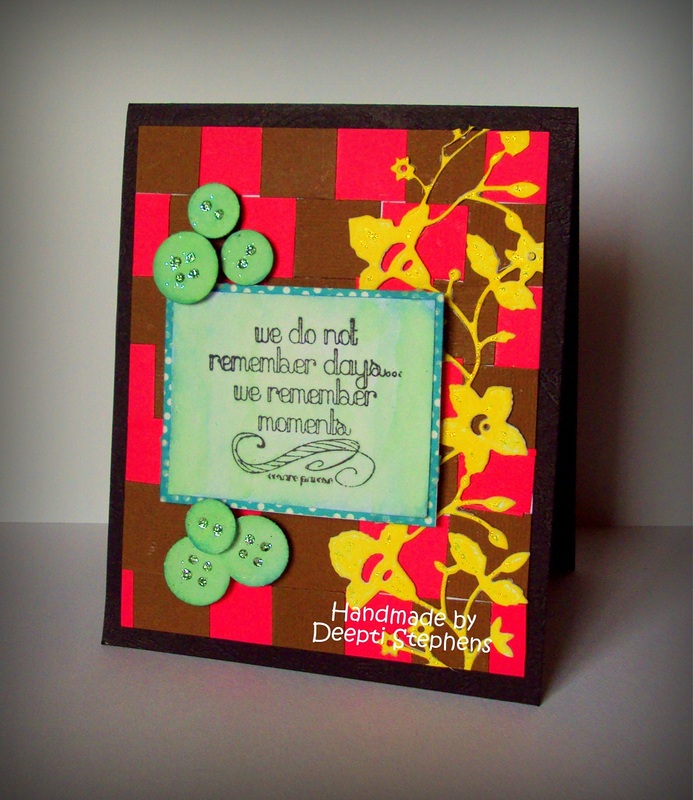 We hope you are enjoying the awesome inspiration by our DT on our latest challenge #14 - Colour Crush - use your dies. I'm Pratiksha from Hyderabad. I'm married to a wonderful man who has been nothing but supportive ever since i began crafting :) Its his insistence that i do something which i enjoy that has me where i stand today :) My lil 3 year old is my sunshine and best critic who always says "this is beautiful mamma, verrrry pretty! :)"
Dont forget to take part in the challenge#14 and wow us with your fabulous work! And btw watch out for post on 15th July! We have some something exciting in store! Lulupu Challenge #14 - Colour Crush! !